Dozens of Fanatics' employees are walking a little easier these days because of a new partnership that is helping take about five miles off their tired feet each day. "I'm like I don't have to walk anymore in the cold," Raichelle Johnson said, of the partnership between Fanatics, Lyft, and the Regional Transportation Commission. 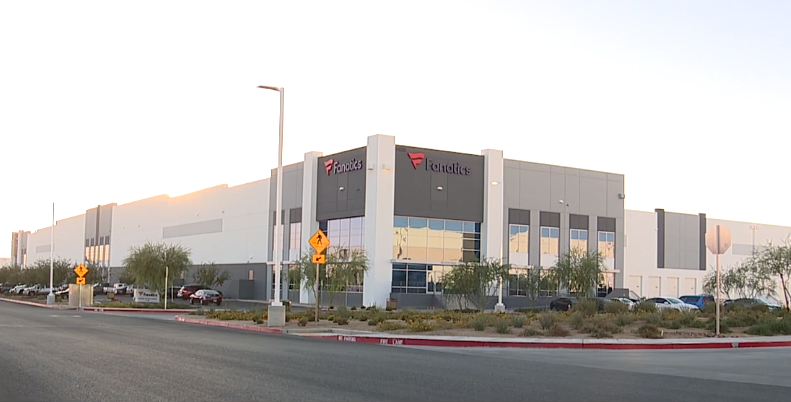 Johnson typically takes two buses on her way to work at Fanatics North Las Vegas warehouse. The problem is those buses stop about two miles from the warehouse on Lamb Boulevard, near Interstate 15. "If people see me walking to work they usually give me a ride," Johnson said. The general manager at Fanatics said he had to find a solution to save his employees. "It is 117 degrees and I've got my athletes are my employees and they are walking 2 and a half miles one-way round trip, five miles," Aaron Hill said. After trying shuttles to get his employees to the bus stop, Hill reached out to the RTC. With just the Fanatics warehouse and a couple others in the complex, RTC leaders said it wasn't financially feasible to add new routes to the business park. "Certainly it would cost tens of thousands of dollars annually for the RTC to extend a route out to that area," RTC General Manager Tina Quigley said. What Quigley and Hill came up with was a new six-month pilot program in partnership with Lyft. The deal gives Fanatics employees access to the ride-sharing service with trips to and from the warehouse and 13 different bus stops in the area. The RTC subsidizes $1 of every trip while Fanatics covers the rest of the cost of the ride. The group is hoping if the program is successful they can make it a permanent feature and possibly add other businesses in the complex to the deal. "We'll probably develop a bundled pass that ties the Lyft rides in with our riders," Quigley said. Hill said it is well worth the cost to keep his employees safe and in good shape for their shifts on the warehouse floor. "It is taking five miles off their feet every day," Hill said. "It offers flexibility I didn't have." For employees like Winda Bankhead, who has been spending as much as $30 a day on trips to and from work using rideshare services, the program is not only saving her money but showing her how much her bosses care. "You have somebody in charge that cares about your safety, how you get home. That means a lot," Bankhead said.